When working with Weedsteamers in collaboration with Weedtechnics you will benefit from 25 years of experience & knowledge. 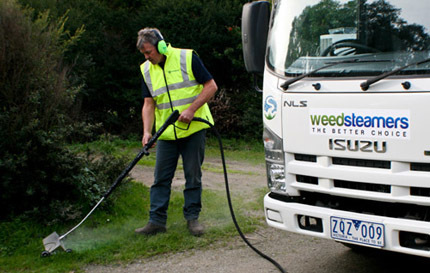 Weedtechnics is the most experienced provider of green, safe weed control in the market place today. Clients include Leichhardt Municipal Council as well as Marrickville, Waverley, the City of Fremantle and Nedlands in WA, the Sydney Harbour Foreshore Authority and many of Sydney's iconic sites such as Darling Harbour, The Rocks & Circular Quay. Of these sites the most striking example of the effectiveness of this system is that involving Sydney’s Leichhardt Municipal Council. It has now managed its streetscapes and open spaces with this system, chemically free for over 10 years! Just imagine implementing a weed management program that is not dependant on weather and raises no health and safety or environmental issues with local residents and is safe for your families, children and environment. Weedsteamers has now made this option possible in Victoria. Because every person especially our children have the right to safe non-toxic play grounds and streets.